Termites are the cancer of homes. They’re insidious and very destructive. The first time you see signs of a termite infestation, they may have already caused significant damage. For homeowners, this is a scary revelation. Not only are you faced with costly repairs, but you’re also worried that the house may be irredeemable. Unlike cancer, it doesn’t take a miracle to reverse the damage done by termites. Termite damage repair is possible with the help of professionals. Here are five tips that may save your home from these troublesome pests. Regular inspection of your homes for signs of termites should be part of your maintenance checklist. An early infestation is hard to spot but not impossible if you know what to look for. How do you know if your house is harboring these critters? The phrase coming out of the woodwork is highly apt. You’ll see winged termites emerge indoors, typically during spring. This is known as swarming and is almost a sure sign that you have a termite problem. The winged termites emerge from their nests for reproductive purposes and to start a new colony. Even if you don’t see the insects themselves, the discarded wings and skin casings are other clues. You might also discover mud tubes that the pests use as a highway from the soil to inside your home. Obviously, you should examine your house for signs of wood damage. These include buckling of walls and ceiling, bubbling wallpaper, and holes in firewood piles. 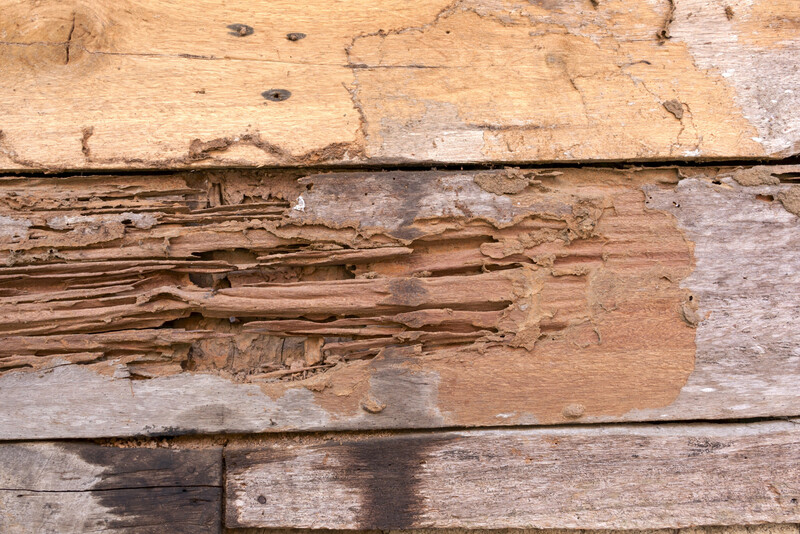 According to the folks at Good Life Construction, termite damage is second to dry rot as the most common finding in the wood repair industry. If you find that you do indeed have a termite problem, the next thing you should do is to call the pros. Since you have no idea if the house will suddenly collapse around you, it’s best to act posthaste. A professional can do a thorough job of assessing the amount of damage that your home has sustained. They’ll give you insight on what repairs to prioritize or if there are things that you can do yourself. And of course, before you attempt any repairs, make sure that the termites have been eradicated. For that, you’ll also need the services of a professional exterminator. As long as you’re not dealing with the Formosan termite, there’s a very low chance that your house is damaged beyond salvation. After you’ve taken into account all the damages the termites have caused, you have two approaches to begin repairs. The first is to replace the damaged sections entirely. The second option is to provide structural support to the damaged wood. The latter option is simpler and less expensive but may not be applicable if the damage is too severe. That is the question. The answer will depend on the extent and location of the damage. Some areas of your home are best left to the professionals. These include repairs to the foundation, roof, or walls with plumbing or electrical circuits. You should also hire a pro if the damage is considerable and affects the structural integrity of your home. When it comes to termites, it’s better to be proactive rather than reactive. There are many things that you can do to prevent a termite invasion. You can fix leaks, address moisture problems, and remove shrubbery around your home. You should also remove or pack away potential sources of food, such as firewood and mulch. But the best way to protect your home is to schedule regular termite inspections. The technician can also provide treatment if necessary. Termites can be a headache but you should always maintain your cool. By following these termite damage repair tips, your home can recover and continue to be in good shape. Termites are a huge threat to your home, and so is mold. Read about solutions to your mold woes by clicking this link.